The next regular HBBCA meeting will be held at 6:00 p.m., Monday, July 27th, at Carmela’s Mexican Restaurant, 13th and G Streets in Arcata. Dinner is optional. Agenda items may be suggested by emailing info@humbike.org. JR Anderson, a resident of Whitethorn, passed away in May as a result of a 2-year battle with Cancer. JR had been an HBBCA member since 1992. Some of our members will remember him showing up at Eureka HBBCA meetings after riding his bike 100 miles to get there. He would spend the night and ride home the next day. After coming down with cancer, he was living in Eureka and riding his bike to and from the hospital for cancer treatments. JR will be missed. On May 19th, the Eureka City Council decided not to adopt the draft ordinance proposed by the Chief of Police that would further limit use of sidewalks by cyclists in the City. While Rick Knapp worked with the Chief to come up with an ordinance that we could live with, most of us are just as happy that no new rules were enacted. As we know, after 40 years, motorists in California still don’t know the laws enacted in the 70’s that pertain to them as they relate to bicyclists and bicycle facilities. After receiving an email appeal from her older sister, the HBBCA found a mountain bike to give to an 11-year old girl who lives in Maple Creek (between Blue Lake and Kneeland). Jaylenne Harris could only get to school by riding a bike three miles on a dirt road, as her mother is disabled. The “little kids” bike she had was destroyed by the road. After receiving the email from her sister, Rick Knapp began to search for a bike. His first stop was with Eureka Chief Mills. Chief Mills canvassed his staff, and immediately Reserve Officer, Kathryn Smith, came forward with a nice mountain bike that she no longer rode. On May 12th, Kathryn and Rick drove to Maple Creek with the bike and a new helmet. “Mr. Rick Knapp and the Humboldt Bay Bicycle Commuters Association, Thank you so much for helping me find a bike, getting a tune-up and tires, and giving me a new helmet. Without your donation, I was riding an unsafe bike. Thank you very much! “Mr. 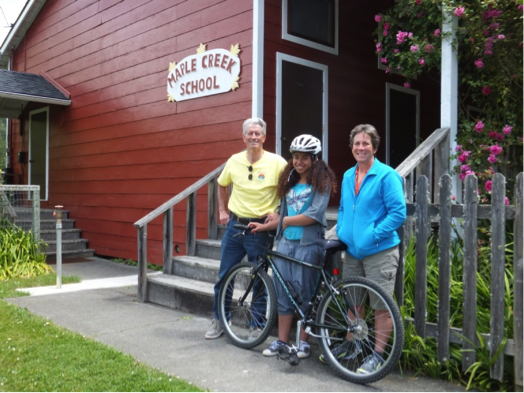 Rick Knapp and the Humboldt Bay Bicycle Commuters Association, Thank you and your organization for assisting our family in securing a bicycle and helmet for my daughter, Jaylenne. You have gone above and beyond to ensure that Jaylenne has a safe way to get to school! Your generosity and advocacy in the community are appreciated. Kathryn and Rick shared more than a “feel good moment” by the outpouring of gratitude. Jaylenne’s mother gave her $40 to donate back to the HBBCA in order to help others in need. 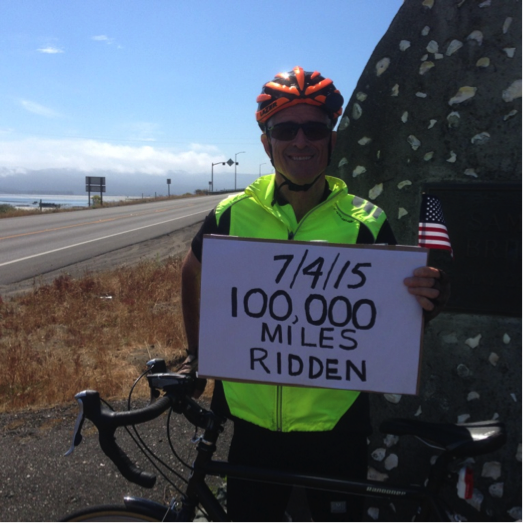 On the 4th of July, I rode my 100,000th mile by bicycle while crossing the Samoa Bridges along with Brett Gronemeyer. I started commuting in Sacramento by bicycle in February 1974 when I couldn’t imagine paying $0.78 a gallon for gasoline! It had doubled overnight. That was during the Oil Embargo and gas was being rationed. One Saturday, I went to a bike shop, laid out $110 for a Raleigh Grand Prix and did a practice 15-mile roundtrip to work. I never stopped riding to work until I retired. Since then, I ride to where other people work (to shop, window shop, meet friends, go to meetings, go to the gym, go to lunch, etc.) I also ride for recreation and conditioning. I have ridden every year a minimum of 2,000 miles, and some years over 4,000 miles. By the 4th of July this year, I had logged almost 2,800 miles this calendar year. While I may be riding more miles, I don’t ride quite as fast, which means I have to spend many more hours on the bike each year than when I was younger. But, I enjoy it just as much as ever. I started keeping track of my daily miles on a calendar similar to the one you can find on the HBBCA website. It allows you to enter your daily, weekly, monthly and cumulative miles for the year. I also use it to keep track of when I changed tires, chains, clusters, etc. At first, I didn’t ride to work when it rained. Later, after getting rained on on the way home many times, I decided to ride rain or shine. I just got the clothing needed to stay dry. Each day, I would look out the window and decide what I needed to wear to ride. Only when there was frost (or snow) on the pavement, did I not ride. As a friend always said, “Every Day is Bike Day.” Well, almost. As a result of a request last year, Caltrans has substantially trimmed the eucalyptus trees in the Route 101 Safety Corridor. As a result of thinning and shortening limbs, there should be less debris falling on the shoulder. Let’s hope so. I greatly appreciate your help with the Arcata Bike Rodeo. This year’s event had the largest turnout ever in the 9 years the Recreation Division has been putting on the Bike rodeo! We had over 150 kids participate. I know the helmet fitting station was one of the busiest stations and I am thankful I had you and other experienced volunteers to run this station. I did not expect that many participants coming out but you guys all did a great job fitting helmets and keeping the flow between stations moving smoothly. Once again, I want to say thanks for your help and I wish you well.